Somewhere in an American cubicle farm, someone sat next to a slightly playful, curiously adventurous aspiring jazz diva. Perhaps she made no secret of her ambitions, or perhaps she (like most office auteurs) plotted her next move in silence. Whatever the case, office workers of the world should take note and take comfort: there is life after the desk. 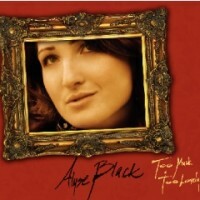 Let Alyse Black and her 2007 debut, Too Much & Too Lovely, stand as proof. While building on a jazz foundation, both in arrangement and in style, to call Lovely a jazz album would be both dismissive and overly simplistic. Black’s vocal delivery relies heavily on a rich, throaty vibrato almost reminiscent of Billie Holiday, but that doesn’t keep her from incorporating elements of folk and a dash of Vaudevillian showtune flair. For all the late-night smokiness of “Stood For Stand For,” there’s the tongue-in-cheek onomatopoeia of “Complete With Sound Effects”; where “Don’t Give Me One Kiss” slinks forward on the strength of Black’s vocal harmonies, the slight accent inflections of “Emeline” are almost a throwback to the Rodgers and Hammerstein school. Ironically, the core strength of Lovely may in fact be what throws some listeners for a loop: while the album moves seamlessly between the mid- and up-tempo pop-leaning tunes, the vocal acrobatics of the showtunes and the timeless cool of the jazz numbers, anyone expecting the album’s entirety to mirror any selected, favored few minutes will in for a disappointment. Special mention must be given to Black’s assembled band, never failing to deliver exactly the perfect backing to the singer’s chosen delivery, be it the motivational speaker of “So Much Brighter” or the sly yet adoring lover of the title track. The old axiom of how anyone can play jazz but almost no one can really play jazz has burned many a stand-up bassist or brush-tip drummer, but Black’s crew rises to the occasion without fail. Music stores and CD collections the world over are littered with albums that reached as high as this but didn’t quite make it; with Too Much & Too Lovely, Alyse Black has turned some very old musical styles into something remarkably fresh. In interviews, Black has hinted that her future work may move in a more direct, intimate fashion. How this plays out remains to be seen, but even Black’s showtime sensibilities can’t hide an innate musical sense that goes beyond how her songs merely sound and into what they actually are. Jazz-based singer-songwriters, meet thy new existential crisis.